Early April is a magical time to be in Japan. There is a nationwide obsession with the “sakura,” or cherry blossoms. And sakura fever is infectious. Late March when we arrived to our hometown, Kawagoe, we started to see glimpses of this fever. The innocent pink blooms start to stand out among the grayness of the city and the bareness of winter. A seemingly stoic passerby would suddenly stop and produce a camera to zoom in on a perfect shot of a colorful limb. 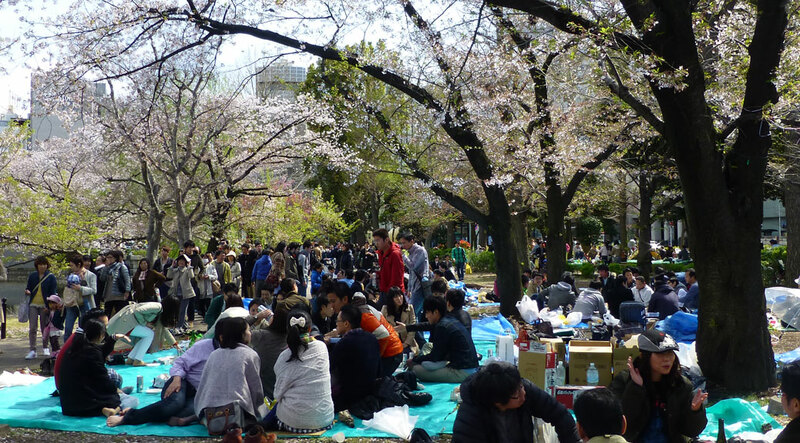 The cherry blossoms set a perfect scene on campus at Tokyo International University as students and parents gathered for the school’s opening ceremonies in early April. The perfect symbolism for renewal, a new school year. 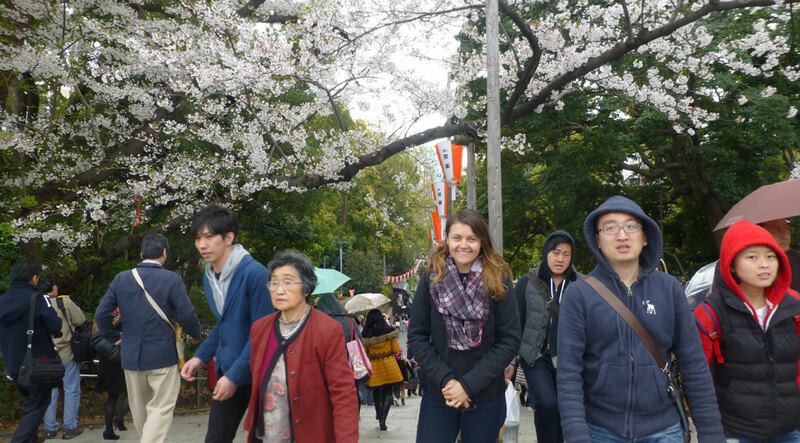 On Saturday, we had an opportunity to see firsthand the “Hanami,” or cherry blossom viewing parties at Tokyo’s Ueno-kōen (park). On the train and the crowded streets outside of Ueno, it’s business as usual. You’d never guess what you’re about to see. We followed the masses. Upon entering, the mad rush of the city floats away and is absorbed by the petals of flowering tree after tree after tree after tree. 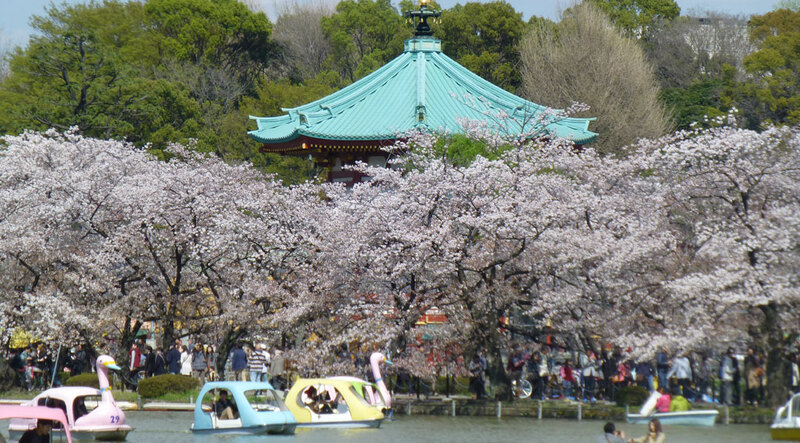 Boats circle Shinobazu Pond as Bentendo Temple watches over. Hundreds of cameras emerge, and we, too, try to capture the sight. But it’s futile. No picture can describe this. Better to put the camera away and enjoy the moment. Part of the Hinami is picnics under the trees. Friends and families gather and stake out their spot with tarps, food and drink. The shoes come off and the party begins. As our guidebook puts it, “locals gather…for rare public displays of euphoria.” Euphoria and maybe a little public drunkenness. But come on, this only happens once a year! The Japanese define what it means to work hard, play hard. Typical? Probably not. 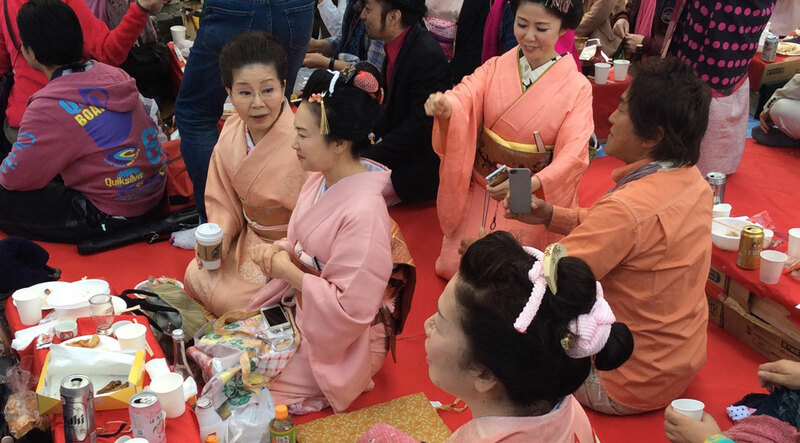 But we’re tourists so we flock to see the geishas. Part of this seasonal madness is sakura-flavored everything. Drinks, pastries, ice cream, candy, you name it! Get it while it lasts. 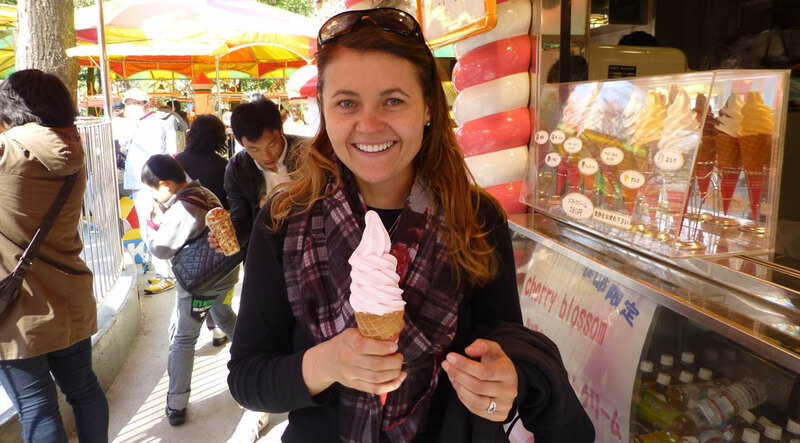 I had the opportunity to try sakura-flavored ice cream and it was one of the best ice cream cones I’ve had here. Not that I’ve sampled a lot or anything. How does a cherry blossom taste, you ask? My answer: not too sweet, a little flowery and definitely a little bit magical. Wow, looks like you both had a wonderful time. Robert, you look like you’ve lost more weight. If the camera adds 20 pounds then you’ve definitely lost weight. 🙂 We ARE walking everywhere but we’re also trying a lot of treats. Thanks! I’m going to need new shoes every couple months at this pace. 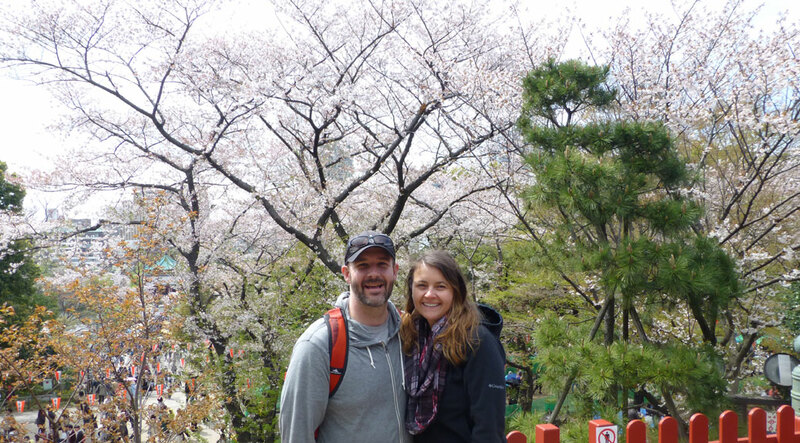 Nice Pictures of the park and the Cherry Blossoms. You two are doing a fantastic job documenting your new life. Keep the updates coming! Looks beautiful!! And I bet that ice cream is amazing! Sounds like you two are off to a great start! You’ve only been there for a short time and already had some great-looking adventures–can’t wait to read more!